In India, I saw many cows roaming freely in the city. They were feasting on plastic bags. Isn't this ironic? On one hand, Hindus seem to accept that humans shouldn't harm cows. Does this not imply that humans should also protect cows from harm (e.g. death from not being able to digest plastic)? Are there any sins related to it according to scriptures? Traditional Deity worship required pancagavya, or five ingredients, which are cow dung, cow urine, milk, ghee, and curd. Cow dung has antiseptic properties, cow urine has medicinal properties, milk is nutritious, ghee is required for fire yajnas, and curd is made into many preparations which are then offered to the Deities as part of worship. Traditional Vedic culture also lists the cow as one of the seven mothers. 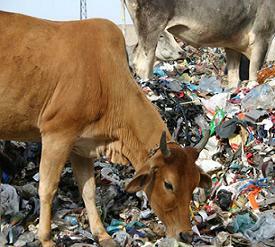 Unfortunately, there is little, if any, environmental regulations in India, and cows are often neglected as well. I know in Vrindavana, a prominent holy place, there has been an active campaign to stop the use of all plastic bags within the city, and there are a few organizations which take in stray cows and rehabilitate them. It's also related to my other answer. According to one version of Pushkar yajna story, because of absence of Savitri for the yajna, Brahma married Gurjar girl, Gayatri. Gayatri got purified by Cow's womb to be worthy to be wife of Brahma. After Savitri ( Srasvati in some versions) arrival, she cursed everyone responsible of yajna. She also cursed Cow to get unholy waste as food in Kaliyuga. Endowed by the powers of yajna, Gayatri diluted Savitri's curse, and said that whatever Cow will eat in Kaliyuga, she will still treated as holy. Not the answer you're looking for? Browse other questions tagged scripture sin animals cows .